Northampton Town have signed striker Jake Robinson following his end-of-season release by Shrewsbury Town. The 24-year-old, who moved to Shropshire from Brighton in July 2009, ended the season on loan at Torquay. He told BBC Radio Northampton: "They have got a lot of history and are a big club for this level so, as soon as the call came in, I was interested. "Last season, I found more consistency and I'm looking forward to this being the season I get things right." Cobblers boss Gary Johnson told the club website: "He is a fantastic signing for this football club. "He can play anywhere across the front four, he is full of pace and he is just the sort of quality player we are always looking to bring to the club." 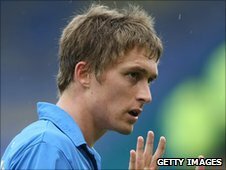 Robinson hit nine goals for Shrewsbury in 2010/11, including a brace against Northampton in the 3-1 win in September, and found the net a further seven times during a 22-game loan spell with Torquay in the second half of the campaign. The former Brighton frontman told his followers on Twitter he only found out from the Shrewsbury website that he was not being offered a new contract. "It was very disappointing, the way things turned out," said Robinson, who hit a hat-trick against his parent club Shrewsbury in a 5-0 win in March, then helped the Gulls beat them over two legs in the play-offs. "But, overall, I enjoyed my two years there." In what has already been a busy summer for the Cobblers, with 10 players leaving Sixfields, Robinson joins Adebayo Akinfenwa, Seth Nana Ofori-Twumasi and Byron Webster in signing for Johnson's new-look Northampton.